Julia and her mom were outside at dusk last evening watering some plants in out yard. There were some bugs out, and Julia said she thought that some of them bit her. How right she was! Today, Julia found a bunch of bug bites on her legs. They were itching her, and we put some calamine lotion on them. Julia came to work with me today. She was great - she was able to entertain herself for almost all of the day with books (and book reports for school), her portable CD player, portable computer game, and other stuff. I parked her in the office of a co-worker who was on vacation, so she also had a PC with internet access. She left me alone to do my work for almost the whole day. The only times she interrupted me was when her bug bites were bothering her. Several of them became large welts, about 2" in diameter. They were also raised and red. The first aid cabinet at the office had little tubes of anti-itch hydrocortisone creme, and she went through several of these today. I offered her an ibuprofen tablet to relieve the inflammation, but she didn't want it. The creme did help. We did give her ibuprofen at bedtime to help her sleep. but she was up a couple of times during the night. Julia's bug bites look a lot better today, but are still itching her. She's been putting anti-itch creme on all day, and it helped. She also took a Benedryl tabler at bedtime, and she slept right through the night tonight. Julia and her mom went off to a going-out-of-business sale a their favorite rubber stamping store, then they went into Boston for this month's blood work. Dr. A.W. emailed us the results (so far) of Julia's blood work. Here they are: AST 25, ALT 12, LDH 218, CK 90, aldolase 4.2, white blood cells 6.19, hematocrit 39.2, platelets 464, and sedimentation rate 8. These are great numbers! Especially notable is the drop in ALT from 35 to 12 in one month. All the numbers are back in the normal range, and assuming that von Willebrands comes back okay, we'll be able to take another tapering step soon. Julia has a friend of hers over for a sleepover tonight. We picked her up right after lunch, then went to a movie, We all saw Jurassic Park 3 (imdb, metacritic). Great effects on the dinos, but more than a bit thin on plot. In the afternoon, the girls did crafts, then after supper we made a cool non-Newtonian substance. This stuff flows slowly, and can be stretched, but will tear if stretched too quickly. Weird stuff. You can make it yourself, if you like. Dr. A.W. emailed us the von Willebrands result - 123, Normal! We can therefore go down another step on Methotrexate to 10mg/week (4 pills), starting tomorrow. Most of the United States is in the middle of a heat wave. Here in New England is no exception. It's been in the 90's all week, and today was no exception. We decided to spend the day at a Hopkinton State Park, a nearby place for lake swimming and picnicing. We had a nice time, and Julia's mom cooked a great lunch on the grill. Julia got extra sunscreen every hour or so, but in the afternoon, she was complaining that the lotion was making her face hurt and sting. At the end of the day, Julia got no sunburn on her face, but her shoulders and arms certainly looked a lot more tan. Julia's face was a bit broken out this morning. It looked better in the afternoon. It was probably from all the sun yesterday, despite the sunscreen. Be careful out there! Julia got invited during the day to sleep over her friend's house again, so off she went. They went swimming and watched a rented movie and had a generally good time. Julia had a good day today. First, she went over to her friend's house again for more swimming. It's great to see her get exercise this way. She also got herself a unique fish tank setup. It's a bowl shaped like a vase, with a plant growing in the top. The plant's roots grow into the fish's water. Check out this web site or this one to see pictures. She's been dropping hints about getting fish, and we had an opportunity to get this, so we did. She loves it! Finally, I ordered Red Sox tickets last weekend, and they came in today. 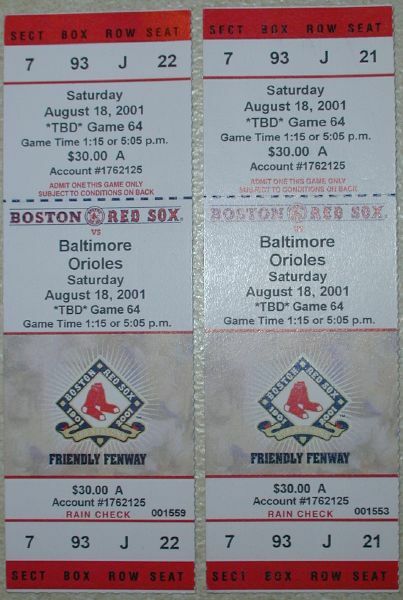 The game is Saturday against the Baltimore Orioles at Fenway Park. Julia has become a real die-hard Rex Sox fan, and she is really excited about going to the game! Today, we went into Boston to see the Red Sox play. It almost didn't happen - Julia got nauseous in the morning, and had several bouts of diarrhea. She ended up taking some Pepto-Bismal tablets, and her stomach settled down. She was fine the rest of the day. Good thing! She did not want to miss her first trip to Fenway! I have a treat for all you loyal readers of the Diary today. It is a special entry in the Diary by a very special guest author - Julia! 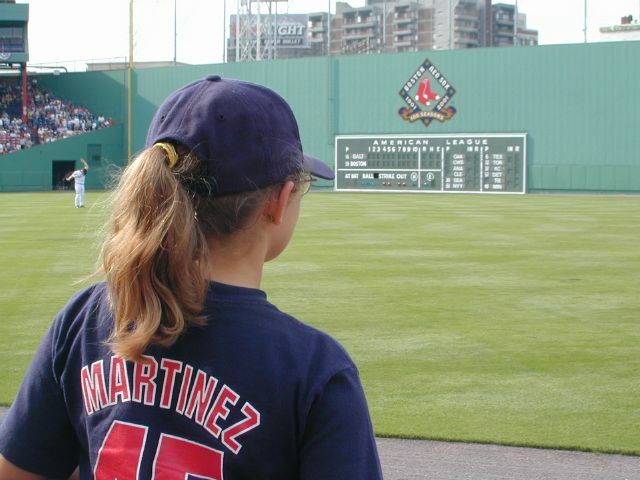 Without further ado, I give you Julia's wonderful account of our special day at Fenway Park in Boston to see the Red Sox. Today, I finally went to Fenway Park to see the Boston Red Sox! I've been wanting to all summer and Dad was finally able to get tickets, but he could only get two. Mom wasn't able to come, which made me feel very disappointed. I found all this out on Thursday, so I had almost two full days to prepare since the game didn't start until 5:00PM. On Friday, and I was barely able to sit down, I was so excited! I was planning to make a poster for the game but I was at daycare all day so I didn't have time. I ended up going to bed very late, around 10:00PM. But I made up for staying up late by sleeping late. I slept until around 8:30AM, which is very late for me. I had some cleaning to do, and I really wanted to make that poster. So I made the poster on the computer with Dad. It looks like this (picture on right). Then I did some cleaning. Finally, I packed a few essentials (my baseball glove, sunscreen, etc.) 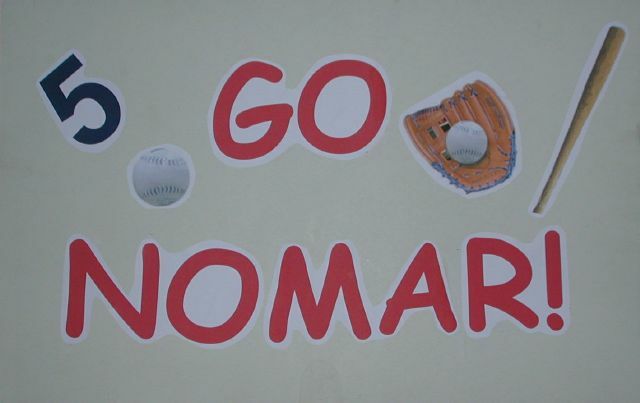 and we were off to the game. We got to Fenway pretty easily, and we kind of got lost but we made it with two hours to kill before we could get into the ballpark. We walked around and shopped a bit (I got myself a key chain). After about two hours and a Popsicle, we got into Fenway through Gate B. We found our seats pretty easily, and they were pretty good seats, but when it filled up, it was kind of hard to see much, plus we were very far away from home plate, and I was kind of disappointed at that. But guess who was about 20 feet from us. Pedro Martinez!! He was giving out autographs, but, sadly, I didn't get one. 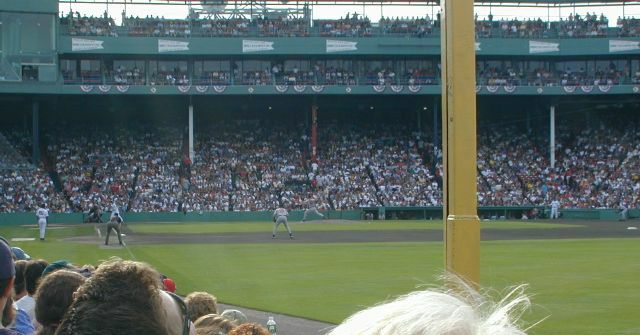 We got a very nice view of the park and we stood right next to Pesky's Pole (Johnny Pesky hit a home run off of it during a World Series game). Then the pitching coach from the Orioles got into a conversation about the pole with Dad! That was cool. Then we went back to our seats, we grabbed some supper, and sat down to watch the game. It was a great game! Mike Lansing hit a homer, and we (the Red Sox) won! I loved the game. I felt excited when the bases were loaded and worried when they put in Derek Lowe as pitcher and dissapointed when the other team scored their only run, and to wrap the whole game up, I loved it!!!!! But the memories that stand out most to me are when the entire stadium did the The Wave two times in a row and when I got to see Pedro in real life really close to him. We left at around 9:00PM and I was in bed by 10. It was an AWESOME day. Nice writeup, Julia! I don't have much to add to that, except some pictures. We noticed today, and for the past few days, that Julia's face have been breaking out in red patches immediately after she takes a shower. It only lasts a few minutes, then the patches gradually disappear. It looks almost lile an allergic reaction to something. Weird.